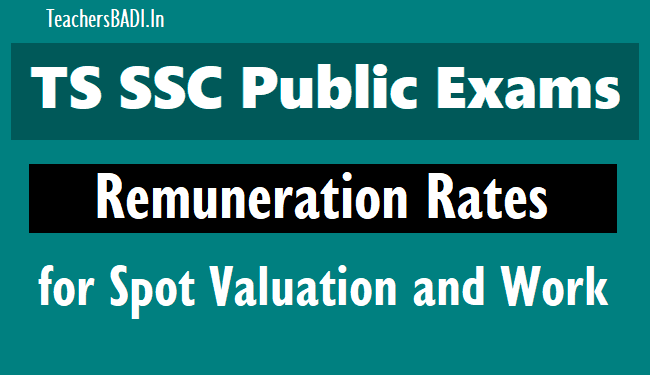 TS SSC Public Exams, TS SSC Spot Valuation New Remuneration Rates-GO.11, TS SSC Exam remuneration rates:: New Remuneration rates enhanced to the personnel drafted for TS SSC Public Exams Conducting, Spot Valuation Camp, Coding Work and Medical & Health Department. School Education Department – SSC Public Examinations – Enhancement of rates of remuneration to the Personnel drafted for the work prior to and conduct of SSC Public Examinations, at the Examination Centres and Personnel drafted for the Coding Work and Spot Valuation of SSC Public Examinations – Orders – Issued. GOVERNMENT OF TELANGANA :: School Education Department – SSC Public Examinations – Enhancement of rates of remuneration to the Personnel drafted for the work prior to and conduct of SSC Public Examinations, at the Examination Centres and Personnel drafted for the Coding Work and Spot Valuation of SSC Public Examinations – Orders – Issued. 1. G.O.Ms.No.135, Education (SE-Exams) Dept., dt.27.03.2000. 2. G.O.Ms.No.171, Education (SE-Exams) Dept., dt.06.03.2006. 3. G.O.Ms.No.22, School Education (Ser.I) Dept. dt.02.06.2016. 4. From the Director of Govt. Exams., Telangana, Hyderabad. II. Rates of remuneration to the Personnel drafted for the Coding Work and Valuation of SSC Public Examinations. 2. The Director of Government Examination, Telangana, Hyderabad, shall take necessary action accordingly. 3. This order issues with the concurrence of Finance (EBS-IV) Department vide their U.O.No.2259/PFS/44/A1/EBS-IV/18, dated 10.04.2018. GO.MS.No. 22 Dated: 02/06/2016: Govt of Telangana-School Education Department - SSC Public Examinations - Enhancement of rates of remuneration to the Personnel drafted for conduct of SSC Public Examinations, Personnel drafted for coding work and conduct of Spot Valuation at Camp Orders - Issued. 1. G.O.Ms.No.138, Education (SE-Exams) Dept., dt.23.10.2008. 2. G.O.Ms.No.43, Education (SE-Exams) Dept., dt.20.03.2009. 3. G.O.Ms.No.14, Education (PE-Ser.II) Dept. dt.17.04.2010. 4. From the Director of Govt. Exams., Telangana, Hyderabad. Lr.Rc.No.26/B-1/2015, dt.05-05-2015, 21.02.2016, 26.03.2016 & 21-04-2016. The Director of Government Examination, Telangana, Hyderabad shall take necessary action accordingly. This order issues with the concurrence of Finance (EBS-IV) Department vide their U.O.No.5513/105/EBS-IV/SE/2016, dated 19.05.2016.